Established in 1963 and part of Godrej & Boyce Group, GODREJ-Material Handling, is India's largest lift truck Manufacturer. The Forklift range of the company includes electric, LPG and diesel counterbalanced forklifts up to 25 tonne capacity, warehouse trucks and special trucks for specific applications. In July 2014, the company adopted the Theory of Constraints (TOC) framework with the objective of revamping its operations to enable it to better meet customer expectations. 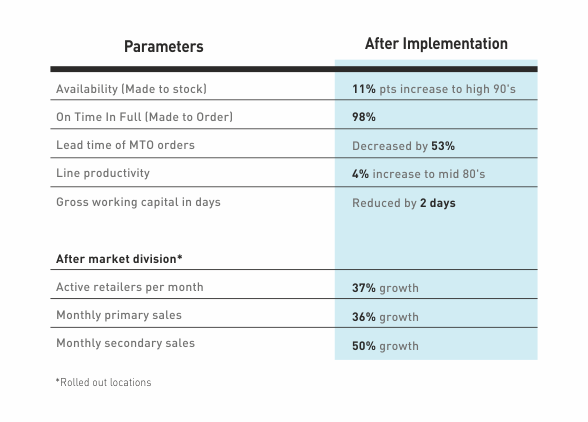 Before implementing TOC, the company was struggling with frequently missed commitments in the market in spite of high Finished Goods Inventory. But within a few months of implementation, the large and varying manufacturing lead times crashed to one-third of the original lead time. Dramatic improvements were made in the supply chain and operations to make this possible. Godrej Securities Solutions, a division of Godrej & Boyce, market leader in the business of providing physical security products. Godrej Securities Solutions is a pioneer in providing security products such as safes, strong room doors, safe deposit lockers and record protection equipment, premises security solutions, home safes, and marine solutions. Banks, NBFCs, jewelers, corporates, defense establishments, and retail consumers of home safes are some of its customers. 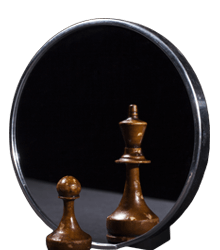 In October 2010, the company adopted the Theory of Constraints (TOC) framework for revamping the supply chain of its Physical Securities Business with the objective of improving on-time delivery performance, reducing lead-time, and enhancing the availability. The project was also expected to have a significant impact on the bottom line of the division. Results achieved within two years of implementation are as given below. In the first 2 years, the profits increased by 3 times, and has quadrupled in the 3rd year. The sales has also doubled in 3 years. A business unit of Godrej & Boyce Mfg. Co. Ltd. is one of India's largest engineering and consumer product groups. Godrej Storage Solutions is the market leader in India in the field of Storage & Material Handling with world-class design, manufacturing, project management, distribution & after sales support. Godrej Storage Solutions embarked on the journey of Theory of Constraints implementation in FY'11 to build a competitive edge in the market by enhancing supply chain performance. 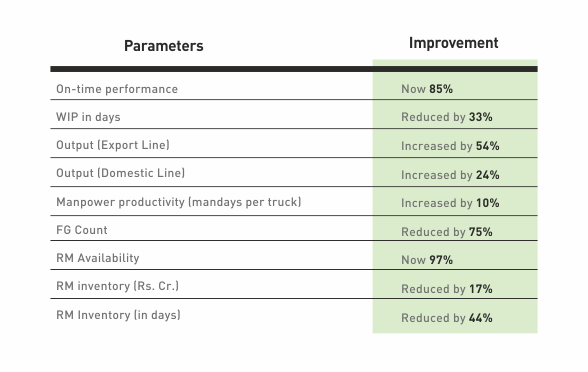 For project orders, the on-time delivery performance from the Chennai plant, improved from an average of 30% to more than 85% + on the originally committed date. This was done while improving the plant output by 22%. In some product categories the lead-time was also reduced by 25%.The company created a new supply chain segment for supplying small standard products with guaranteed delivery, within 3 days of order receipt. The new supply chain helped Storage solutions expand into new segments using the dealer network across the country. The sales in this segment has grown by more than 100%, while the overall sales has increased by over 25 % year on year basis. Leading player in office furniture systems, the company designs, manufactures and commissions as per customer preferences. With implementation of DBR and CCPM solution components, the office furniture division of Interio improved the on-time performance from an average of 50% to over 98% in 2 months of starting the implementation and has been maintaining the performance for the last 18 months. 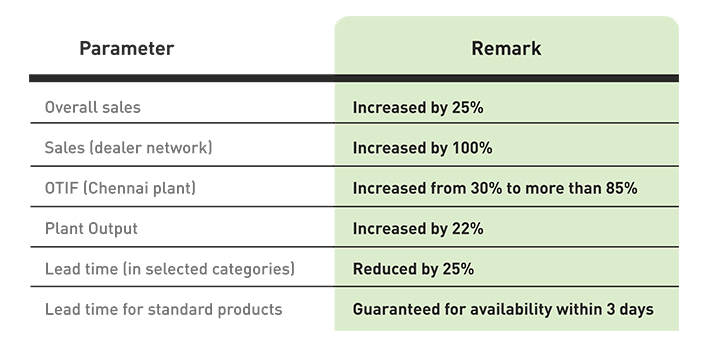 There has been 70% reduction in WIP and 40% reduction in Finished Goods inventory. The lead-time has reduced by 30% to 50% in various categories. There has been about 20% capacity release in the manufacturing facility besides about 80% reduction in expediting costs like air shipments and overtime. The division has improved the overall profitability by improving the mix of lucrative small orders, where customers demand lower lead times. Die Cast Dies and Panel Tools manufacturing major implements multi-project CCPM to improve on-time delivery (as per originally committed dates) to 85%+.while reducing overall lead time. Manufacturer of tooling for auto sector. With the implementation of CCPM, Filtrum has been able to reduce the overall lead time by 25%, while improving the on-time delivery performance to about 90%. Bajaj Luminaires, a division of Bajaj Electricals Limited, is one of the leading players in the business of providing solutions for commercial, industrial and outdoor lighting. 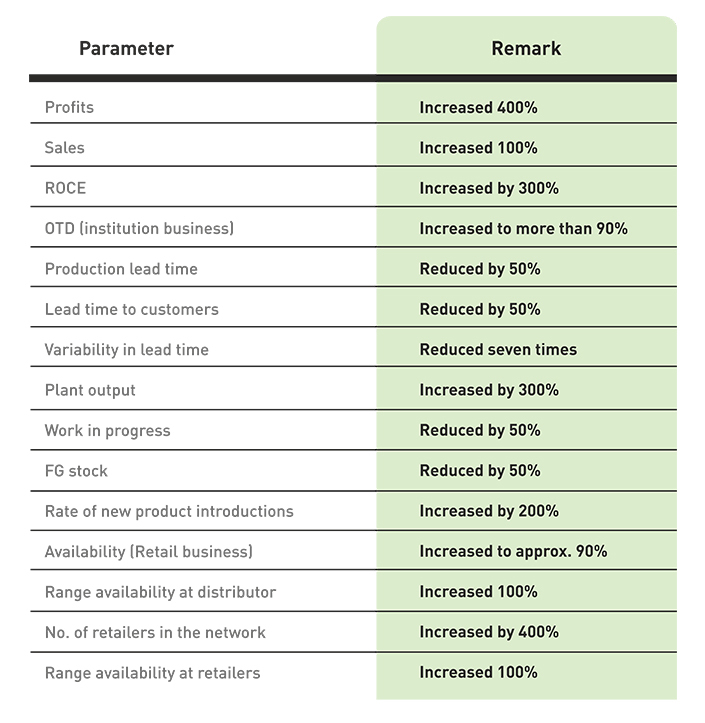 The on time in full delivery performance of the suppliers in this market is about 20% to 30%. The result is locking of the capital of the dealers over a long period, and late delivery penalties. Hence , delivering On Time In Full and in shorter lead times is a Decisive Competitive Edge (DCE) for Luminaires. 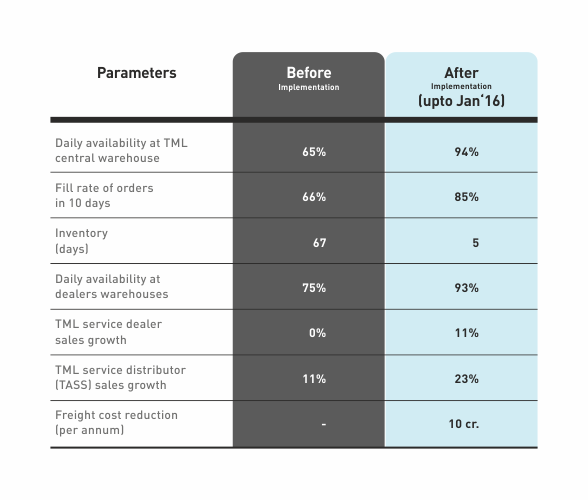 In a period of two years, Bajaj Luminaires now delivers on time in full, for about 85% of its orders with the remaining 15% orders being fulfilled in full within 7 days. (The average lead time of industry is around 5 weeks.) In FY 2013-14 the sales increase over last year was 10%, while that of the key players was negative and at best a growth of 3%.The inventory, in days, for the BU is reduced by 20%. Kirloskar Oil Engines Ltd. (KOEL) is a leading Diesel Engine and Generator Set (Gen-set) manufacturer in India. They design, manufacture and supply Diesel Engines, which is at the heart of Gen-sets. Though this industry is aware that customers need fast and reliable delivery, KOEL and its competition could only offer customers delivery lead times of over 4-6 weeks because of the complexities in their manufacturing and supply chain. But after moving away from forecast-based model to consumption-based operations, the company is now able to offer guaranteed deliveries in one week. The company’s working-capital-turns also improved phenomenally converting KOEL from a persistently cash-starved business to a healthy one. Kirloskar Oil Engines Ltd. (KOEL) is a leading Diesel Engine and Generator Set (Gen-set) manufacturer. The company services its Gen-sets through dedicated service centers across India. Customers, both Institutional and Individual/small businesses, need fast and reliable service. Without functioning gen-sets, they could be at risk of not having power back-up when required. But unfortunately, the service centers faced severe parts availability issues and could not complete service within the promised 2 days. Procuring and producing as per forecasts had resulted in mismatched components, and large and variable lead times. And whenever attempt was made to improve availability, the inventory and related costs would become untenable. 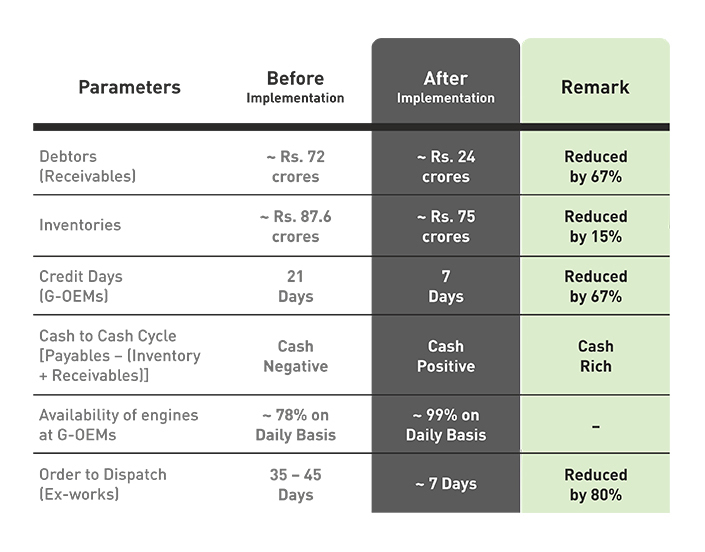 But after the company implemented a TOC based replenishment model for spares procurement and distribution, KOEL was not only able to offer guaranteed availability of spares but was also able to realize substantial financial benefits. Fleetguard Filters is a tier 1 component supplier to key OEMs in the country. The company has a large design, development and testing set-up for engineering filtration solutions and products. They also have to depend on relatively unorganized tier 2 and 3 suppliers to support them in new product design efforts. Their products have to fulfill several conflicting requirements – these should be able to meet new filtration targets, keep vibration low, adhere to pollution norms, and be compact. Before overhauling began, at any point of time, the company would have about 150 projects being executed simultaneously by independent teams. The environment was chaotic; resources were stressed. Going home late and working on holidays was the norm. Things changed dramatically after the company implemented flow principles of TOC (Theory of Constraints with the help of Vector Consulting Group). Productivity improved three times and iterations were reduced by more than half. Consequently there was a dramatic improvement in reaction time to OEMs. Apart from the great advancement in numbers, what the company best appreciated was the decline in stress levels of people, and improvement in overall harmony. J.K.Fenner (India) Ltd, the market leader in mechanical power transmission & sealing solutions, has partnered with Vector Consulting Group since September 2014 to achieve enhanced service levels for its customers by building an agile supply chain using the Theory OF Constraints principles. J.K Fenner has transformed its operations to gain a decisive competiive edge in the market by providing higher availability of its products as well as faster and reliable delivery to its customers .The following are the results of the same. Mahindra First Choice Services (MFCS) is the largest multi-brand car service company in the country. MFCS kicked off the TOC implementation with Vector, in the Chennai cluster by putting in processes of TOC replenishment for spare parts while creating a hub and spoke model of inventory locations. 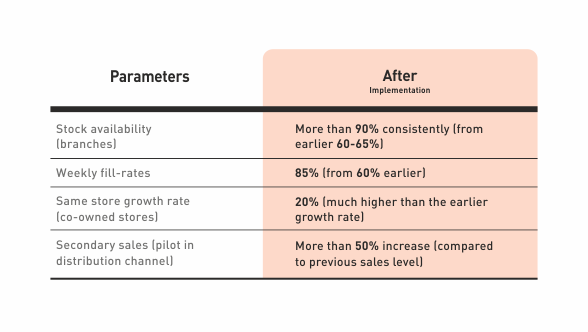 Within a year of TOC implementation, the following results were realized. One of the largest distributors of engine lubricants for automobiles in Indonesia. TOP1 sources the oil from USA. With Vector, TOP1 reduced its inventory from 7 months to 2 months in its warehouses in Indonesia, while improving availability to near 100%. Top1 procures most if all its products from US. In the first phase of the roll out of the retail replenishment solution to select retailers, the range of the companys products available at the retailer has more than doubled and the distributors reach has increased by over 50%. Tier 1 Auto supplier manufacturing radiators for passenger cars and commercial vehicles Most auto parts Tier 1 suppliers struggle to meet the daily requirements of the OEMs. This is not helped by the fact that the daily requirements by OEMs of a part fluctuate widely. Hence, Tier 1 companies are in the constant state of firefighting and chaos to provide the service, leading to loss of capacity, high rejections, high inventory and exhausted managers. Tata Toyo Radiator Limited (TTR), through the deployment of TOC - solutions and thinking with Vector Consulting Group, has been able reverse this scenario. Its service level to OEMs has improved significantly on daily basis. There is now a optimal FG stock for each of its OEMs. TTR has increased its output by over 30% from existing infrastructure. The implementation of the TOC flow Management solution in NPD has doubled the output rate of new products. KFIL is a leader in automotive and non-automotive casting supplies in India and abroad with manufacturing facilities at Koppal and Solapur. It produces grey iron and S.G iron castings for various applications, such as cylinder blocks, cylinder heads and various housings for automobile, tractor and diesel engines. 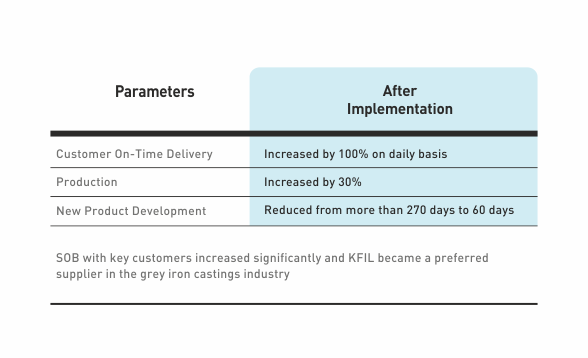 The Casting industry, of which KFIL forms a part, is associated with very poor (Daily) On Time Delivery (OTD). Therefore, to offset the high lead time and unreliability, OEMs are forced to maintain huge inventories at their end (20-30 days). Mahindra First Choice (MFC), a multi-brand car spare parts company was launched in April 2015. Though it is part of the well-known business house of Mahindra & Mahindra, the new brand faced stiff competition in an already crowded space. MFC partnered with Vector Consulting Group to build a Decisive Competitive Edge based on reliability of availability in their distribution model which can then enable them to grow the business in a sustained manner. In order to accomplish this goal, the company implemented TOC replenishment solution in the entire supply chain. 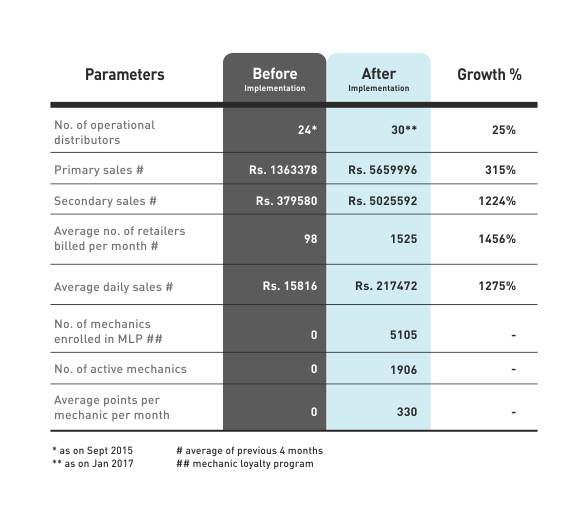 And counterintuitive to the practice of launching a brand with deep discounts and schemes, the company offered no schemes and instead initiated demand creation through a Mechanic Loyalty Program (MLP). Within a year of implementation significant operational and financial results were achieved. The company is now in the process of growing its distribution footprint based on the TOC philosophy. VIP Industries Ltd is one of Asia’s largest luggage manufacturers. The company partnered with Vector in November 2013 to help grow the top-line and bottom-line of the company by using TOC way of thinking. VIP has now aligned its central planning function, hard luggage production, raw material purchase, soft luggage purchase from India & China and the logistics function (network design and movement of goods up to the branches) to the principles of TOC. It has also implemented auto replenishment along with churning of SKUs across ~250 of its co-owned exclusive stores and are now enabling the same processes across their franchisee-owned stores. Post these implementations the following benefits were experienced. Pt. Megasari Makumur (Godrej Indonesia, part of Godrej Consumer Products Limited, India) has embarked on a journey to transform its business of manufacturing and distribution of various household products like air fresheners, wet tissues, baby care products, etc. through the platform of 'Theory of Constraints'. They have partnered with Vector Consulting Group since December 2013. Since then they have reaped the following benefits..
1. Overall inventory days has been reduced by 28%. 2. Inventory turns improved by 37% (from 6.38 to 8.75). 4. ROCE increased from 47% to 65%. 5. Availability at the central warehouse and depots / branches has increased from 92% to 98%. Godrej Interio, a business unit of Godrej & Boyce Mfg. Co. Ltd., is India's largest furniture brand. In order to stay ahead in the market, the company continuously designs and manufactures new and innovative products that emphasize comfort and aesthetics while delivering environment friendly, durable and functional furniture solutions. Godrej Interio's NPI (new product initiatives) division has ongoing development projects as well as enhancement projects in its kitty. Initiatives called "full track/fast track projects" involve development projects of completely new furniture products which have to be designed from scratch and introduced. The enhancement projects are typically smaller projects which involve improving existing designs based on feedback from sales team. Until recently the company was struggling to complete both sets of projects on time. 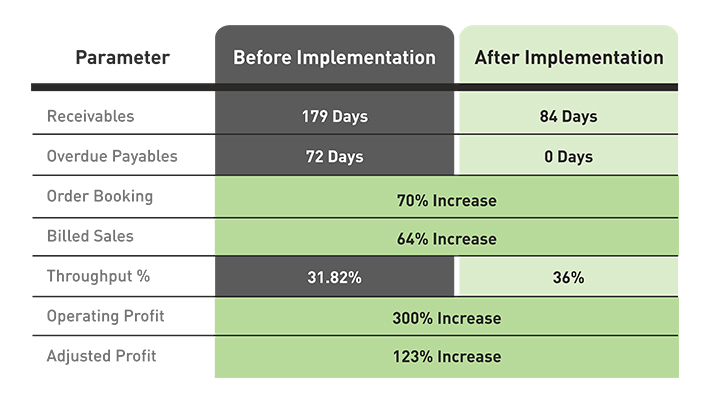 After one year of TOC implementation, the fully completed number of enhancement projects has gone up by 100% and the lead times have crashed across the board. Now the company is able to deliver projects on schedule 70% of the time with a jump of 50% from last year. In the coming months, these parameters are expected to further leap-frog ahead. Leading player in customized home kitchen solutions After successful implementation in the Office Furniture division, Godrej Interio, decided to extend the Theory of Constraints implementation to Modular Kitchen segment. The supply chain consists of around 15 Suppliers and 2 in-house plants producing around 2000 different parts which should be delivered in full as per order for installation. 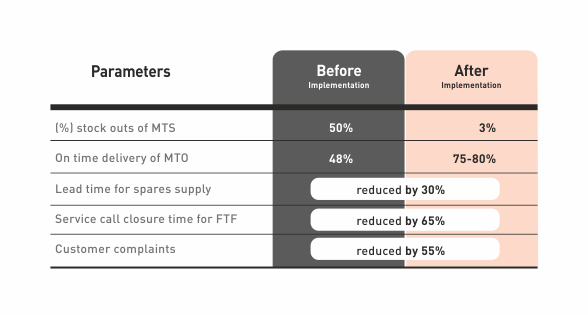 With implementation of TOC operations solutions, the ex-factory On- time -in- Full performance has gone up from around 50% to 98%. All this has been achieved while the Order booking has been growing at around 25% y-o-y. One of the leading companies in fashion footwear industry. The company has achieved over 97% availability in its central warehouse, which is probably amongst the best in the fashion industry. The production lead-time has dropped from 45-60 days to 17 days. The total inventory has reduced from 125 days to 65 days. The company after flat sales for about 4 years till 2009-10 has increased sales by 15% in 2010-11 and 25% in 2011-12. The company has rolled out the replenishment offer to its showrooms and distributors, which provides offer of high inventory turns and high availability. Most clients have reported more than 30% jump in sales with improvement of inventory turns from 2 to more than 5. Leading manufacturer of tools and files. Using TOC solutions, JK tools have increased output by 30% from current capacity in 6 months of implementation. Its plant in Kolkata doubled its output in one year. India’s leading leisure goods retail chain (books, toys, music, movies and stationery). It runs 18 large format stores across 10 cities in India apart from numerous small format outlets at Hotels and Airports. 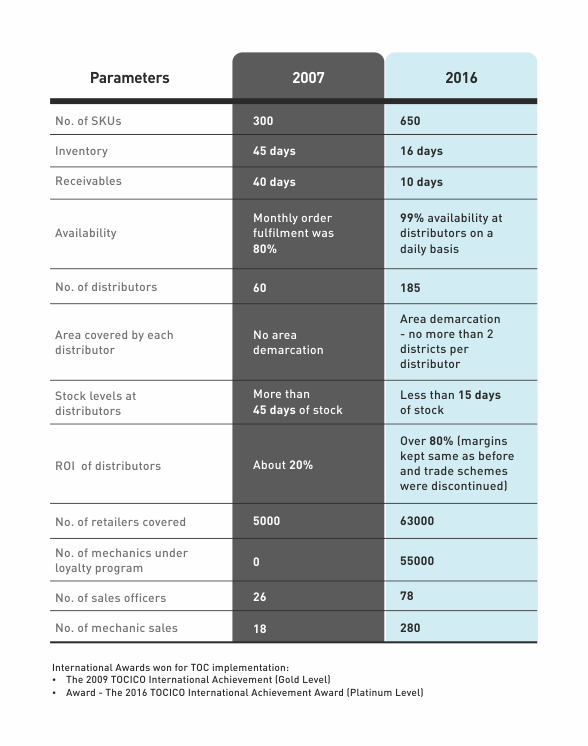 Landmark was grappling with the challenges of high inventory and significant unavailability across its stores as also the challenge of managing over 400,000 SKUs in its chain.In the first year of TOC implementation with Vector, Landmark has reduced its chain wide inventory by over 30% even as it has added a Central Warehouse, which did not exist before. The availability of goods in stores has increased to over 90% and decline in sales has been arrested. The company has put in place robust mechanisms to manage its portfolio across categories and is effectively managing the product mix in stores. The results of this are evident in the trend of sales growth and high inventory turns. Retail chain with about 80 stores across India, selling fashion footwear. In the first year it improved the store inventory cover from 10 months to 5 months, while increasing sales by 30%. The released capital was used to add 30 stores to the existing 50. The company will have another 20% growth in 2011-12 without infusion of capital. Godrej Interio is a pioneer in home and office furniture in India. The company’s service division with its 42 service centers manages more than70,000 spare parts sourced from their own plants and from more than 100 domestic and international vendors. In this environment the order quantities can be as low as 1 pc per year and the lead times could vary from 7 days to 100 days. The wide range of SKUs and fluctuating lead times had led to major supply chain and last mile execution problems for the company. But after the implementation of the TOC processes for management of spares and service operations, Godrej is now able to offer exemplary and seamless service to their customers. Service levels to the customers have been improved by process improvement without increasing the fixed cost of the service providers. Completed a new manufacturing plant in a location ravaged by rains in 8 against the industry standard lead time of over 12-14 months. One of the leading players in textile industry. Using CCPM, Abhishek Industries (Trident Group) erected a spinning plant of 30,000 spindles, a greenfield project, in a record time of 9 months as compared to the industry benchmark of 12 months. The ramp up to peak production was also achieved in 40 days as compared to the typical industry time of 3-4 months. World’s largest producer of Pig Iron. Tata Metaliks sets an industry benchmark in executing Blast Furnace relining shut down using CCPM. Blast Furnace relining shut down completed in record 23 days with 25% extra scope and with expenses at 87% of the initial budget. Peak plant production reached in record 10 days. Usually the lead-time of such shutdowns and revamps is between 45-60 days, and reaching peak production takes about 3 months.The earlier similar project was completed in 30 days. Engineering, Procurement, Manufacturing and Site Erection of structural steel forIndustrial Buildings. With implementation of flow principles of CCPM, the lead-time of projects has reduced by 25%, with 15% more output from manufacturing facility and 30% more output from engineering resources. Leading shirting fabric manufacturing company - part of Raymond group. The objective of this assignment is to build a decisive competitive edge of High reliable on delivery performance at SO level by reducing the Production lead-time and capitalize the same in the market to increase company sales and profits. By Implementing TOC solutions Raymond Zambaiti has got the following benefits within a short span of 8 months. 1. Production lead-time is reduced by 25% (from 45/50 days to 33 days) at SO level. 2. 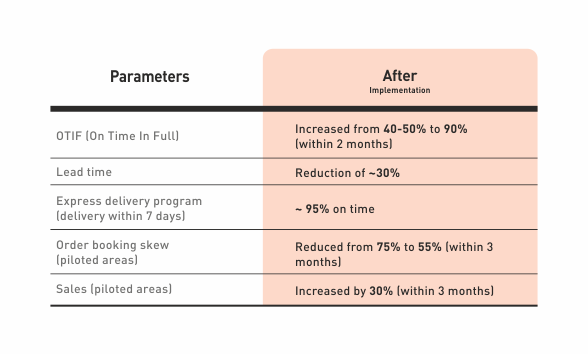 On time delivery performance (at SO level) has been improved to 95%. 3. In this industry order assortment (multiple SKUs in one sale order) getting dispatched together on or before the agreed due date is a critical requirement of their customers. Before TOC, production flow entity use to be at SKU level leading to desynchronized flow at SO level and more waiting time at warehouse. (First SKU waiting for the last SKU). After TOC the production flow entity has been changed to SO level. 50% reduction (15 days to 7 days) in assortment waiting time at company warehouse has been achieved because of improved synchronization and flow. 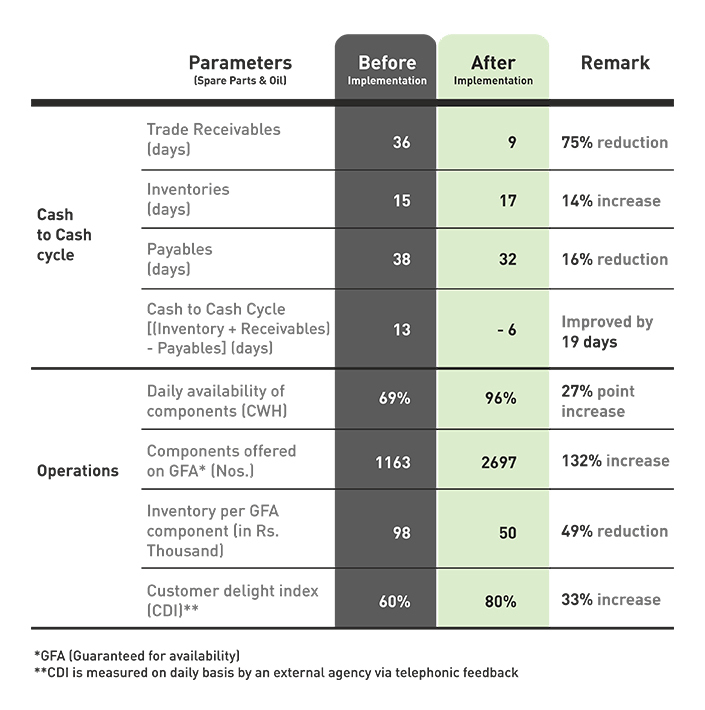 This reduction also results to improved cash to cash cycle. Hercules Hoists Limited, a part of the leading industrial conglomerate: the Bajaj Group, manufactures to order industrial material handling solutions for lifting, moving and storing. Hoisting solutions marketed under the brand Indef are market leaders in that category.